Kelly's Korner: A Hoot of a Birthday Party! 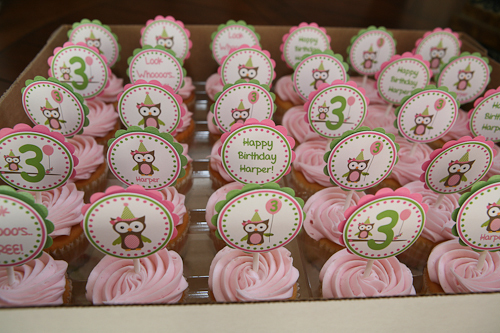 A Hoot of a Birthday Party! Harper's birthday isn't until Monday but we have had a weekend full of birthday fun already. My parents came in early Friday afternoon. 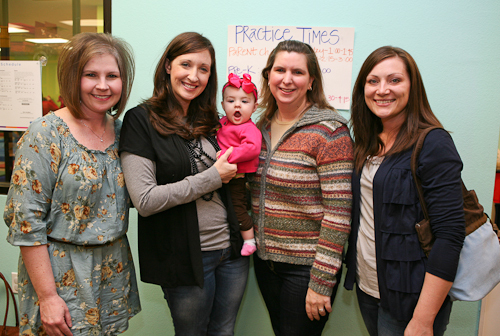 They helped me pick up Harper from school and then they played with the girls the rest of the afternoon. Scott's parents came later in the afternoon. 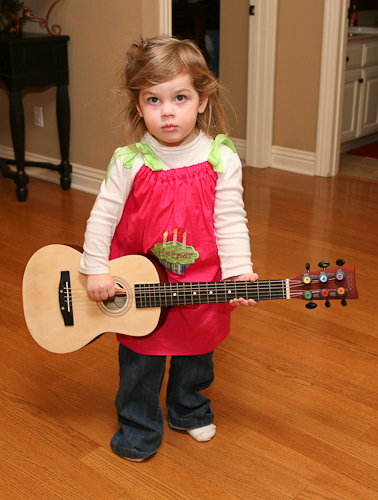 Harper was reunited with the guitar we got her for Christmas. Her pap-pa had re-strung it for her. We had pizza for dinner and just spent time visiting. We bathed the girls and got them in their cute matching monkey pj's. Oh these girls are at a sweet age. 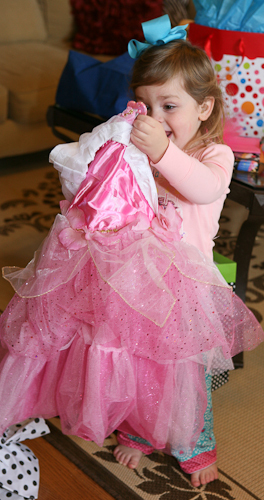 Today we just spent time around home and then this afternoon after naps - Harper got to open her birthday gifts. The gifts had an overall theme of Disney Princess and music. She was thrilled with her Sleeping Beauty dress. The overall winner was this little drum. And I am the glutton for punishment who bought it for her. 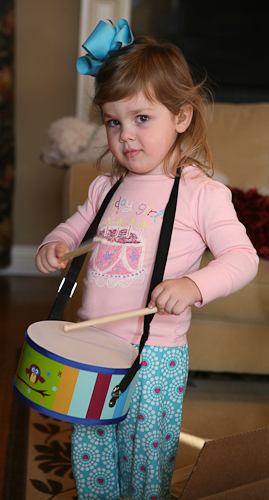 I also got her a tambourine, a harmonica and kazoo. And she LOVES them. Her aunt and uncle got her a keyboard and microphone. It's loud at our house now but oh so fun! We were so lucky to have both sets of grandparents here to help us celebrate. 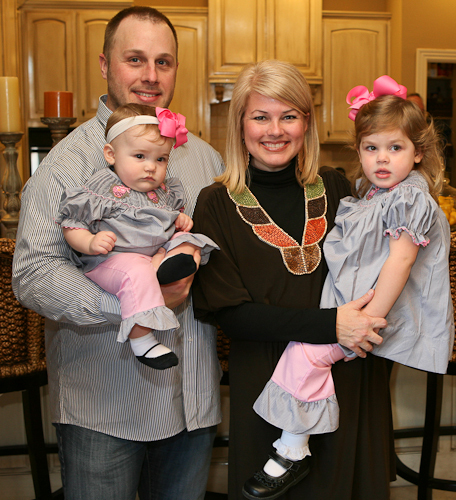 These two little girls are SO loved! 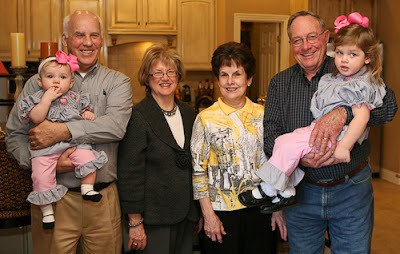 I loved their little matching Owl outfits I got from My Bella Bums. 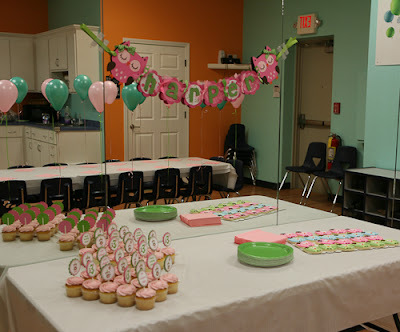 We had Harper's party at the Little Gym. 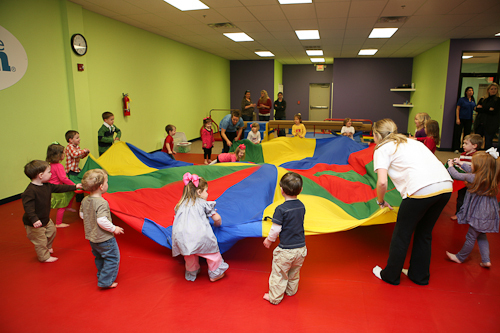 I love being able to have it somewhere that is fun for kids and I don't have to have it at my house. It's so easy to just show up with cupcakes and they do the rest. 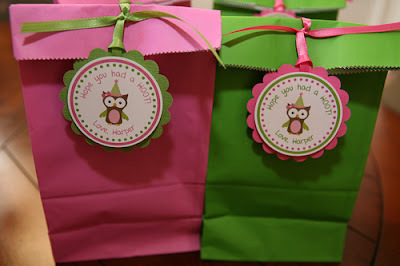 These were our little goodie bags - pink for girls and green for boys. 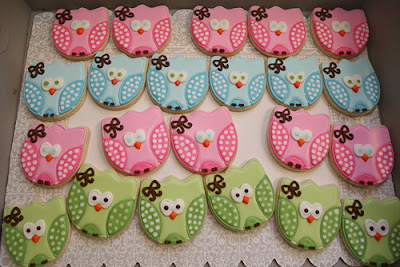 My friend Robin who normally makes cookies has been on a maternity break after having a new baby. This sweet girl Holly who is a friend of a friend recently started making cookies. She made these owls for me. They are seriously the cutest thing I have EVER seen. I hated that we ate them they were so precious. I had the little favor tags and cupcake toppers made from here. I loved all the cute owl stuff. Harper is SO into the gymnastics stuff. And she has no fear. Everyone kept telling me over and over how strong she is. 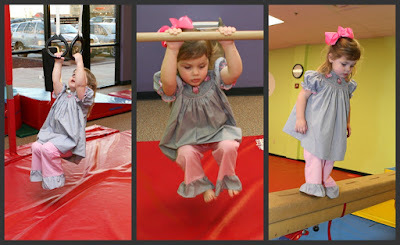 I'm sort of thinking we may have to drop dance and go to gymnastics instead. We may have a little Mary Lou Retton on our hands! 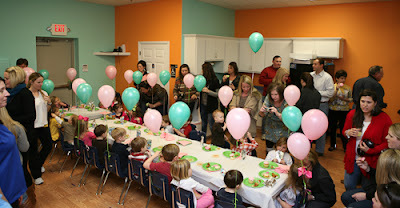 I was thankful for all of our friends who were able to come to the party. 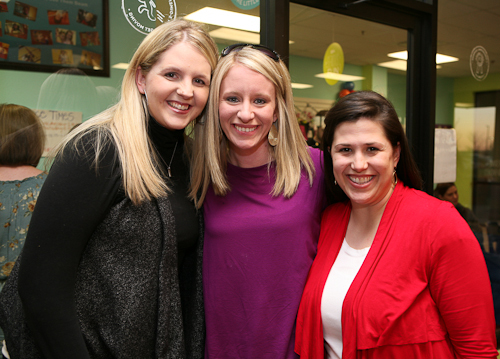 This is Sydney, Jennifer and Rebekah. Harper had the BEST time. I was so excited just watching how excited she was. 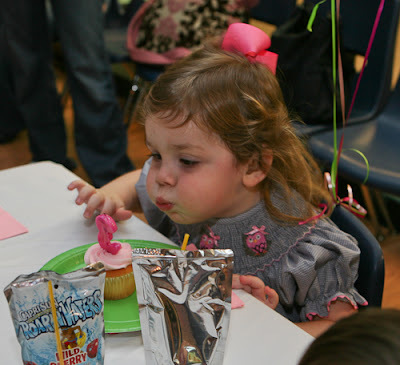 Harper blowing out her candle. 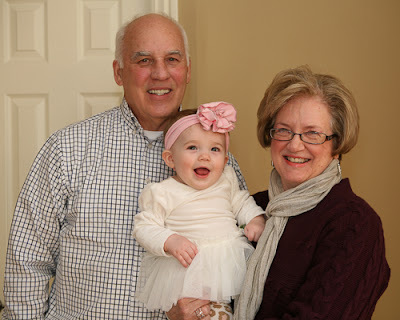 She has been singing "Happy Birthday" every day for a month or more. 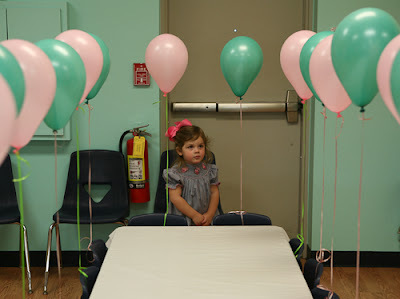 She had SUCH a fun party. I loved how easy and stress free it was and I loved how happy Harper was. I can't believe my little girl is THREE! We still have some fun things planned for her actual day! It's just such a fun age - why not celebrate for several days?